Romanian engineer Raul Oaida has taken the concept of creating a LEGO car from miniature toy to life-size machine with his latest creation. 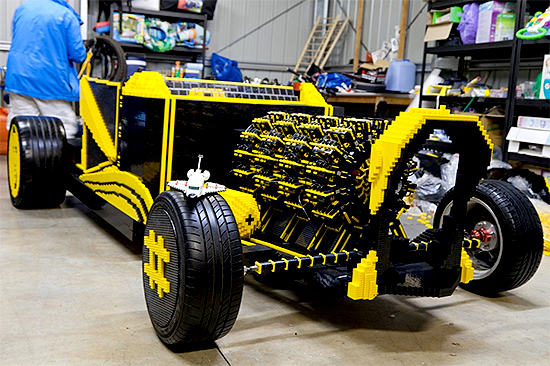 This one-of-a-kind hot rod, constructed out of over 500,000 LEGO bricks, is fully functional, and nearly every piece of the car is made entirely of LEGO! This includes the car’s engine, featuring 256 miniature pistons and running off of compressed air. While not the fastest ride around, only reaching a top speed of 18 mph, this vehicle is more than capable of showing us the possibilities behind one of the oldest construction toys in the market. Oaida, who has worked with LEGO in the past, is entirely self-taught in his craft, and shows off the versatility of the seemingly simple LEGO brick with his constructs. With help from Australian marketer Steve Sammartino and donations from Twitter, Oaida brought this fantastic LEGO vehicle to life, and we can’t wait to see what he creates next!